An artist's depiction of the TESS spacecraft in orbit around Earth. NASA's newest planet-hunting telescope is hard at work gathering its first data — but just how many planets might it hunt down? 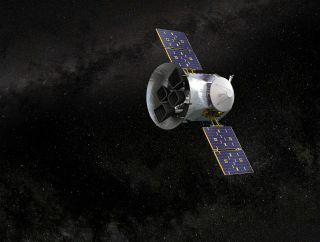 According to new estimates put together by scientists on the team behind the Transiting Exoplanet Survey Satellite, or TESS, the instrument should identify about 10,000 planets in its two-year mission; 3,500 of them should be smaller than Neptune, the mission's focus. And if the telescope can stay at work longer than its current plan, those numbers will only go up. "There's no reason for the spacecraft to stop working after two years" — beyond, of course, the price tag, Jessie Christiansen, who studies exoplanets at Caltech and NASA's Exoplanet Science Institute, told Space.com. Christiansen is involved with the mission but not with the new study. The new estimates, which describe three different options for extending the mission, will also help determine which holds the most promise if that time comes, she added. Of course, these aren't the first estimates scientists have made of how many planets TESS will spot. But the new forecast takes advantage of a major new set of data: a giant batch of measurements made by the European mission called Gaia, which has pinpointed the location of more than 1.5 billion stars in the Milky Way. That map is valuable to TESS because it tells astronomers precisely how far away a given star is, Christiansen said. Pair that information with the star's observed brightness, and scientists can figure out how large the object is. That's valuable because TESS is best at spotting planets around smaller stars — so by using Gaia's data, scientists can better play to the instrument's strengths, Christiansen said. The new estimates will help the science team ensure the mission is still on track to succeed at its primary job: measuring the mass of 50 planets that are smaller than Neptune. As eye-catching as 10,000 planets are, the particularly important number here is the 3,500 sub-Neptune worlds, Christiansen said. Those planets will be TESS' proving grounds in terms of its formal requirements and will help scientists understand how small rocky planets are formed. These estimates used a new expected inclination spread of other solar systems, or how dramatically their planets stray from a perfectly flat disk of orbits. That orbital neatness affects the number of planets that TESS' transit method can identify. This method exploits the small dip in a star's brightness as the planet passes between its sun and the instrument. "If you were an alien civilization looking at the sun, you wouldn't actually see all eight planets," Christiansen said — you would see the transits of only the handful of planets that happened to line up perfectly from your extraterrestrial vantage point. "We have to guess at what that inclination spread looks like in other solar systems." Our solar system has a spread of about 7 degrees, but new analyses suggest that this number is more dramatic than average. Even better than the estimate itself is the fact that it shouldn't be long before scientists start ticking off those 10,000 worlds. TESS is sending its first data back to Earth today (Aug. 8). And while the team will look through that data carefully before releasing it to the public — to be sure everything is working as expected and that there don't appear to be any issues — even just that first set of observations should introduce scientists to new worlds, Christiansen said. "I think we definitely can start finding planets in that first batch of data," she said. The research is described in a paper posted to the preprint server arXiv.org on July 30.